A new Chris Priestley book is an event to be celebrated, and his latest does not disappoint. More in line with his fabled Tales of Terror books than with his other release this year, Superpowerless, Curse of the Werewolf Boy is the first in the Maudlin Towers series, featuring the charming young students, Mildew and Sponge, and their adventures at the school for ‘the very best and brightest of boys’, set at an indeterminate period of the 19th Century / early 20th Century in northern England. Whereas the Tales of Terror books struck a fine stylistic chord of impending horror, Curse of the Werewolf Boy dials down the horror (slightly) to make way for a playful wit, as the bumbling-yet-eloquent pair of school boys, Arthur Mildew (“of the Berkshire Mildews”) and Algernon Spongely-Partwork – aka Mildew and Sponge – stumble upon a series of peculiar happenings on the grounds of Maudlin Towers. Mildew and Sponge spot what they believe is a Viking ghost meandering across the ha-ha (the ditch at the end of a playing field, to prevent sheep wandering onto the school grounds, countryside trivia fans). And this is by no means the strangest sight they will come across in the next 235 pages of brisk plotting; Curse of the Werewolf Boy is by turns engrossing and fiendishly clever. It isn’t ruining anything for you to mention that, yes, there is a werewolf boy somewhere in the plot, and how this creature fits into the cogs of the story works very well indeed. And to sprinkle extra sugar on this already fine treat of a book is the fact that Mr Priestley himself illustrates it throughout, and his black and white depictions of the settings and characters are grim, atmospheric and quite brilliant (there is even a demented cameo from one ex-children’s laureate) – the visual highlight for me is the chapter heading illustrations throughout the book. On the strength of this first book, Maudlin Towers will be a series of some notable quality. 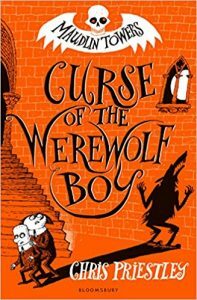 Curse of the Werewolf Boy is a fantastic book, and suitable for all mischievous minds, 7 years old and upwards, boy, girl, man or woman.